Go is a game of near infinite subtlety. Two players take turns placing stones on a grid with the goal of eventually claiming more territory than their opponent. Each match has hundreds of turns and the slightest difference in stone placement can have huge knock-on effects in the future. Back in 2016, Go champion Lee Sedol faced off against Google’s AlphaGo in a set of 5 matches. 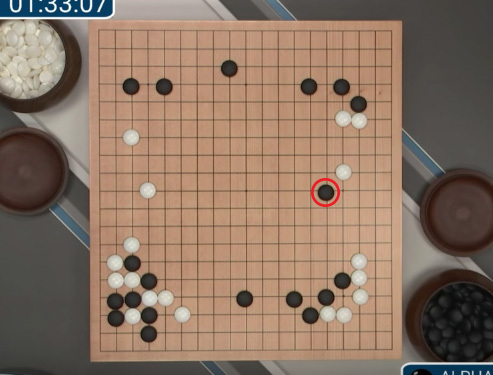 On the 37th turn of the second match AlphaGo made this move (a “shoulder hit” on Sedol’s white stone). This move baffled everyone watching, because shoulder hits are thought to be weak when made so far from the edge of the board. AlphaGo’s move 37. Can you see what’s so profound about this move? I definitely can’t, and neither could any of the world’s leading Go experts at the time. Nearly 100 turns later, this seemingly weak move allowed AlphaGo to claim a huge region of territory and win the game. This stands as a testament to the enormous scope of Go’s strategy space. Even though the game has been intensely studied for centuries, we’re still just scratching the surface of the games intricate, multi-layered strategies. At the same time, this also stands as a testament to why I never want to play Go. The game is far too complicated. It takes months of practice before a new player can even make any sense of what’s happening. Go is played on a 19 x 19 board, meaning there’s a total of 361 possible locations. To make things worse, most of the stones you play will remain on the board permanently. Each of these stones has complex ripple effects that influence the rest of the match, potentially for hundreds of turns (again, there’s 361 total locations.) Chess is also a complex game, but at least the number of Chess pieces on a board goes down over time! In short, the game is both very large and very interconnected. By “large” I mean there’s a huge number of options available to the player. By “interconnected” I mean those choices have a real impact on the future – not just one turn ahead but also dozens and hundreds of turns ahead. Large games can be fun to explore and interconnected games can be rewarding to master. But together, these properties will quickly turn your game into a confusing mess. Civilisation VI is another game that suffers from being both large and interconnected. Each match of Civ starts out fresh and exciting. You’re mapping out your surroundings, meeting other players and setting up your first few cities. There’s often a real sense of pride and accomplishment to be found in building your early civilisation. The first 100 turns are the best part of this game, hands down. 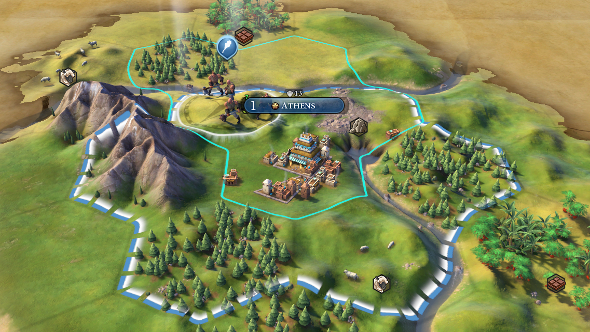 Athens shall become the capital of sheep and chocolate! But at some point you fill out your map. You meet everyone else. You claim all the available territory. At some point the excitement falls away and you start grinding turns without a clear aim. You know you have to reach one of the victory conditions eventually – but that could happen 5 hours from now! Until that point, you spend most of your time shuffling resources between your science, culture and economy bars. Throughout the game you’ll unlock 2% bonuses to this, 5% bonuses to that and sometimes even 10% bonuses to something else. These stacking bonuses mean that your civilisation grows exponentially. Your decisions accrue compound interest, meaning earlier turns have way more impact on your victory than the later turns. Small decisions you made when placing your Ancient Era cities will have a huge impact on the final output of your Information Era cities, 10 hours later. If you lose, untangling the reasons why you lost is virtually impossible. If you win, untangling the reasons why you won is also virtually impossible. Should I have gone for writing before masonry? Should I have placed my city two tiles further west where it might have gained a coal resource but lost an iron resource? At best, you might be able to point to one or two major mistakes you made that really stick out. These problems are even worse during wartime. While at peace, you only need to make occasional decisions and can often pass a turn in a few seconds. But when you’re at war you suddenly need to micromanage dozens of little units on a massive grid, like you’re playing a match of Super Chess inside of a larger grand strategy game. Turns can quickly start taking 5 to 10 minutes (or longer) and the game starts to feel like it will never end. Not only do you need to position all these little dudes – you also have to balance the economy and build a space programme. There’s another popular series that, while similar to Civ on the surface, has one key change that hugely simplifies things. 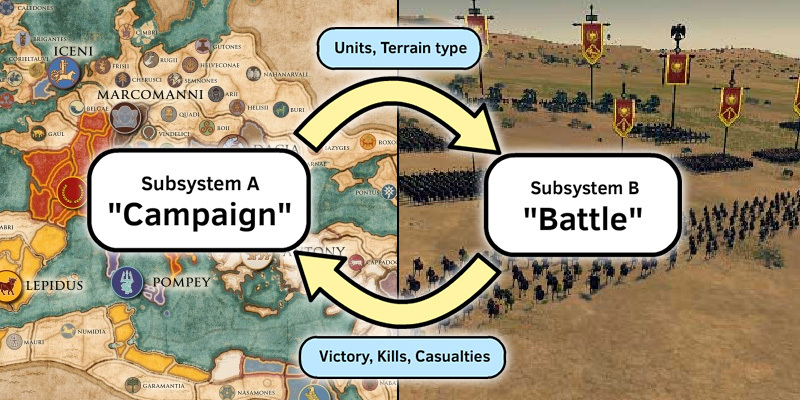 Total War has 2 separate modes (the “campaign” mode and the “battle” mode) and it switches between them on a regular basis. In campaign mode, the player must decide where to position their armies and how best to recruit new soldiers. In battle mode, the player is in charge of positioning squads of soldiers to maximise their chances of success. Total War is still a large game but it has been sectioned into two distinct subsystems. These subsystems do still interact with each other! But these interactions are limited and clearly defined. When you initiate a battle you’ll pull in all the nearby units on the campaign map. And when you finish a battle your kills and casualties will be passed back to the campaign map. But other things are discarded as you move between modes and this is what keeps the game understandable. Most of the world map is irrelevant to your battle and most of what happened in your battle is forgotten as you move back to the world map. Only a few key pieces of information are passed between the subsystems. The ripple effects one section will have on the others are easy to predict and understand, which lets the player treat each section as a relatively self-contained challenge. So by sectioning, I’m talking about splitting your game apart, while also leaving a few carefully chosen links between those parts. Total War is still a large game, but careful sectioning has made it far less interconnected and therefore much easier to learn. Smaller games can also benefit from sectioning. In the Pokemon series you are shuttled between an adventure mode and a battle mode. Some areas on the adventure map (tall grass, in particular) will move you into a battle. When this happens you bring the Pokemon in your party into an arena and other information about the world around you is temporarily forgotten. When you finish the battle your Pokemon’s health and status ailments are carried back over to the adventure map. But many of the things that happened in that battle are discarded. If your Pokemon’s stats were altered (perhaps its speed was reduced) then this will no longer apply. If one of your pokemon changed the weather or created other kinds of arena hazard these will no longer apply either. The information on this screen persists between battles, but a lot of other things are wiped clean. This means each Pokemon battle is fairly self-contained and the things that do carry across are easy to think about (“my Pokemon took a lot of damage”, “my Pokemon has been poisoned”). How About a Few Rounds of Gwent? You don’t have to section your game into separate modes. Some games work sectioning much more directly into their structure. In Gwent, each player starts with a hand of 11 cards. Each card is worth a certain number of points and might have abilities that change the points of other cards. The player will draw a few more cards over the course of the game, but not very many. This starting hand is more or less what they’ll have to work with. The game is sectioned into three rounds and the winning player only has to win two of these. You win a round by having more points at the end of it than your opponent (and it doesn’t matter how many more points you have. Winning by 1 point is counted the same as winning by 10 points). At the end of each round the battlefield is wiped clean, meaning each player goes back to zero points. Your cards have to be conserved across all three rounds. This creates an element of bluffing where you try to bait out your opponent’s good cards, weakening them on future rounds. We (Blue) won the first round! But our opponent has more cards to play on future rounds… Yikes! In Hearthstone, a strong early hand can give you so much momentum that your opponent can’t hope to recover. But in Gwent, a strong round 1 doesn’t mean you’ve won. If you spent too many resources winning round 1 it might even weaken your overall position! By sectioning the game into rounds they limit the role of getting good draws. 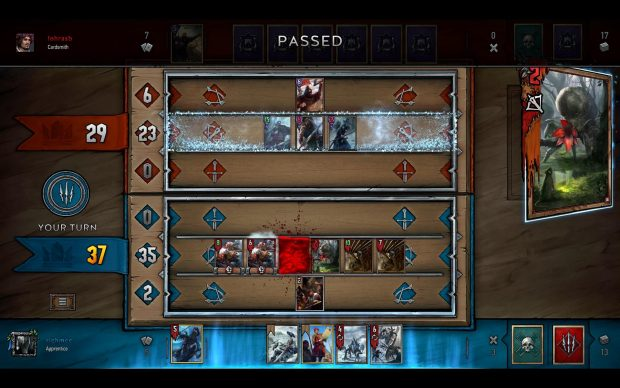 A while back, one Gwent faction had an incredibly strong strategy that revolved around playing dwarves, “boosting” them really high (raising their points value) and making them “resilient” (meaning they are not cleared away between rounds). This strategy was considered pretty degenerate and was eventually nerfed. The key problem was that it ignored the rounds system by letting players carry a huge number of points from round 1 into round 2 (and potentially into round 3). It blurred the lines between each section a little too much and the game suffered for it. You should think carefully about what information you want to carry between your sections. Returning to Civ, I think it could be greatly improved with a similar rounds system. The game could have 5 rounds (an odd number to avoid draws) where each round corresponds to an era of history. Most consequences could be wiped clean between rounds, and each player would only need to win 3 rounds to win the match. The rounds could be designed to last 10 minutes each, meaning a Civ game could be completed comfortably in one hour rather than ten. I’d really like to see more games experiment with this kind of idea. 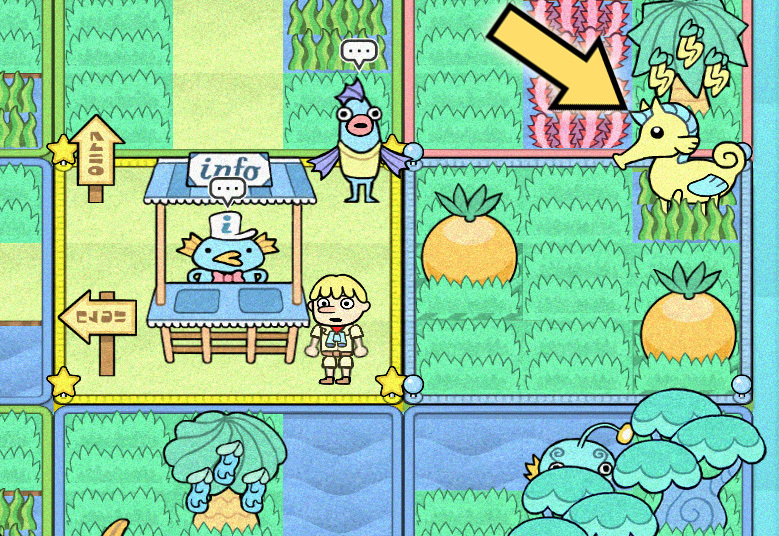 In Patch Quest, my own game, you explore a patchwork island. By “patchwork”, I mean the terrain is split up into a grid of patches, each of which can contain treasure, hazards or a mixture of both. Patches in a particular area will fit a theme (one area might be wet and thorny, while another might be dry and sandy) but the exact contents of each patch are randomised. Patch Quest is sectioned into “adventures”. Every time you reach a checkpoint (a friendly landmark) your damage is cleared and your item cooldowns are reset. More importantly, the patches making up the world are shuffled. This means the player is always presented with a fresh and slightly unique set of challenges. It also means that any minor modifications you made to the world (moving creatures, harvesting plants and such things) are forgotten. But if you find a useful patch while you’re out exploring (maybe it satisfies a quest or contains a buff) you can pin it down next to one of these landmarks. This particular patch then won’t be shuffled away. Now that I’ve pinned this Seahorse near the Tourist Office, I can always get an easy ride! The player therefore doesn’t have to worry about the exact layout of the world (it will change soon, anyway). But they can also keep a handful of specific, helpful things they find on their travels. Sectioning is a great way to break down a complex game into simpler subsystems. This article has covered a few ways to section a game, but there are many more! As a guide: Think about whether your game has any natural seams where it could be easily sectioned. There might already be places where only a handful of consequences carry over to future parts of the game. Then you can think about which of these consequences are the most important. You can highlight these, while discarding the others. Effective sectioning isn’t just about what you discard, but also what you carry over. Your subsystems should be mostly split, but also carefully linked in a small number of simple ways. Game design is a relatively new discipline and there’s a whole lot of unexplored territory out there. However you end up designing your game, remember to have some fun trying new ideas. Thanks for reading! If you liked this article, why not read some of my other ones (like this article on increasing replayability through “shuffling”). A major update for Patch Quest released last week. It lets you ride seahorses, raid an ancient tomb and more! This video will run you through the full changes. The game is currently available for free, so now would be a good time to grab it if you’re interested!